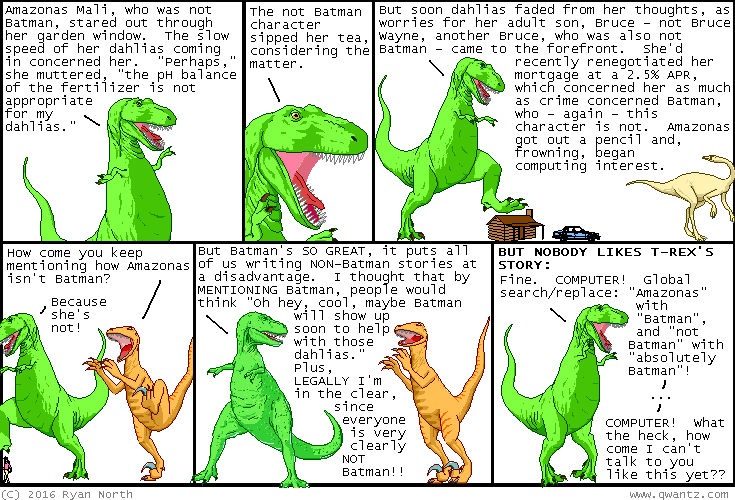 Dinosaur Comics - July 25th, 2016 - awesome fun times! –Wait... WHY? Are wishes REAL all of a sudden? July 25th, 2016: San Diego Comic Con was amazing! I met so many great people and signed tons of Romeo and/or Juliet, AND I saw some terrific Squirrel Girl cosplays. Please let's have times where a bunch of awesome people get together to get excited about comics all the time, am I right? ?